Dum Laga Ke Haisha, written and directed by Sharat Katariya, is worth its weight in gold. It is crafted with a string of wonderfully well-written scenes that flow seamlessly into each other, eventually culminating in a heart-warming climax. The film plays primarily with emotions but not for a moment does it stray anywhere near what might be deemed excessive. Produced by Band Baaja Baaraat director Maneesh Sharma and presented by YRF's Aditya Chopra, the film tells a slice-of-life love story that is exceptionally unconventional, and not simply because of the heroine's body type. The film itself is of the sort that delights in its humanity, a trait deeply embedded in its core. Katariya's chiseled screenplay abounds in situations that thrive on a fine blend of wit, humour and genuine crowd-pleasing sentiment. What stands out is that Dum Laga Ke Haisha achieves its ends without having to resort to the kind of manipulation that Bollywood is notorious for. There is a nice easy flow to the 111-minute narrative, which brings alive the little pleasures and pains of life in a realistic yet effective way that much of contemporary Hindi cinema has forgotten all about. The film is set in mid 1990s Haridwar, where school dropout Prem Prakash Tiwari (Ayushmann Khurana) is weighed down by life in more ways than one. He draws solace from Kumar Sanu, whose pain-dripping voice he drowns himself in the video-audio parlour that his domineering father owns in a back-lane of the holy town. The young man's burden increases manifold when his family forces him to marry Sandhya Verma (Bhumi Pednekar), an overweight girl who has nothing in common with him. Sandhya is educated and aspires to be a school teacher; Prem is a dullard who is pushed around like a lifeless log of wood by his father and friends. Dum Laga Ke Haisha isn't an average Yash Raj Films production, so the overnight nuptials do not spark an instant transformation in Prem. It only makes him rebel against his fate. Sandhya, on her part, is a woman of substance - not the kind to take the jibes of her husband and her in-laws lying down. Sparks fly as their relationship lurches from one messy dead-end to another until a door opens, magically, to show Prem that both beauty and happiness are always more than skin deep. Dum Laga Ke Haisha is a fond tribute to Hindi film music of the 1990s - the retro feel is enhanced by Anu Malik's compositions - but it does not let that admiration for the past spill out of the soundtrack and into the drama. Ayushmann Khurana sheds the period attire of the disastrous Hawaizaada to play another laggard at odds with the expectations of the world. But here, he is not only far more convincing, he is also brilliant in the way he fleshes out the clueless boy-next-door who discovers that he need not always play by rules set by others. But the biggest source of the power of this film is debutante Bhumi Pednekar, the oversized lead actress who is both pretty and talented. She fills every frame with warmth and depth. Dum Laga Ke Haisha wouldn't, however, be the film it is without its secondary characters and the actors who play them. Sanjay Mishra, a consummate scene-stealer, isn't the only one here who is in fine fettle as always. Seema Bhargava (as the heroine's mother) and Alka Amin and Sheeba Chaddha (as the hero's mother and aunt respectively) add considerable weight to the film. YRF hasn't produced a better film in years. 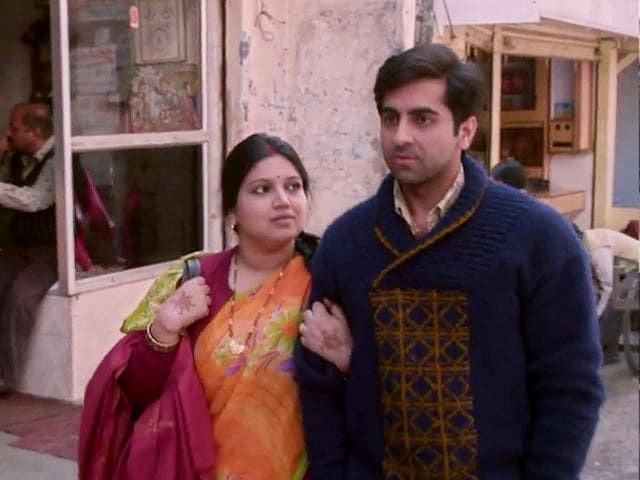 Dum Laga Ke Haisha is more than just a must-watch. It should to be held up as an example of what a mainstream Bollywood banner can achieve when it lends its clout to an out-of-the-box idea executed by a director who clearly knows his onions better than most in the business today.